Dave is a musician and sound designer based in Edmonton, Alberta since 1991. 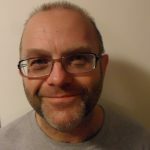 Educated at the University of London and the University of Leeds, he has composed and produced music and sound designs for over 500 projects in theatre, film, dance and multi-media for three decades… (read more). A native of Edmonton, Leanne Maitland is active as a chamber musician, orchestral player, soloist, and teacher. She performs regularly with the Edmonton Symphony Orchestra, Vif String Quartet, and Obsessions Octet. Other recent projects include touring Europe with the Obsessions Octet, a string trio at SkirtsAFire Festival, Bicycle Symphony at the Kaleido Festival, a recital on the Holy Trinity Concert Series, alt-folk band Dead Red Pine, and organizing Phil Kline’s UnsilentNight. 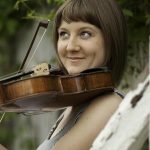 She has also played with the Edmonton Opera, Alberta Baroque Ensemble, Enterprise Quartet, and at the Citadel Theatre. Leanne teaches at the Society for Talent Education, and her private studio. She has music degrees from the University of Alberta and the Eastman School of Music, and an Artist Diploma from McGill University. 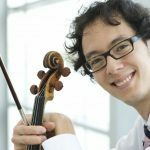 One of Canada’s leading violinists, Robert Uchida has been hailed for his “ravishing sound, eloquence and hypnotic intensity” (Strings Magazine). He has been heard throughout North America and Europe as a soloist, chamber musician and concertmaster to great critical acclaim… (read more).